AirPlay is a fantastic built-in iTune/iDevice app that makes music streaming easy-breezy, which is why it's being added into anything and everything Home Theater. 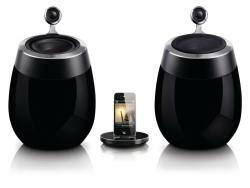 Philips Electronics is jumping on the AirPlay bandwagon by adding five new speaker systems to their Fidelio series. Shipping this September, we have four models ranging in price from $229 to $499. The most affordable model, at $229, is the AD700W, a two-speaker system. It features a 10-watt amp, and includes a USB port for recharging iPhones and iPods. Jumping up to $329, we have the DS3881W, a stand-alone speaker unit with a 16-watt amp. The DS3881W is also the only SoundSphere model to feature a rechargeable lithium-ion battery pack. The stand-alone DS88000W will cost you $399, and features a 2x15-watt amplifier. At $499, the DS6800 is a dual two-way speaker system that is a lesser powered version of the top of the line DS9800W system (pictured). At $799, the DS9800W includes dual two-way speakers (1' tweeters, 5.25' woofers, and a 2x50-watt built-in amp) and a table charging stand for iPods and iPhones. It will cost just under $800 when it ships in July (every other model will ship in September). The top-shelf model could be nice for a kitchen or office space, but will these speaker be big enough and have enough power to play music at higher volumes? Time will tell. Also, apparently AirPlay licensing and WiFi integration adds $100 to the production costs of devices like these. What do you think? Is it worth it?